Barbados’ Prime Minister, Mia Mottley addressing the formal opening of the Caribbean Week of Agriculture 2018. 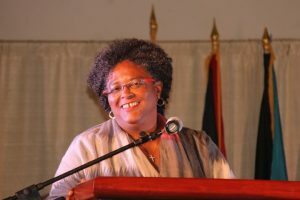 The Caribbean Community (CARICOM) needs three regional shipping hubs and slackening paperwork bottlenecks to improve transportation, even as Barbados’ Prime Minister, Mia Mottley said producing large amounts of food in Guyana and Suriname would be senseless if the constraint of regional transportation is not removed. 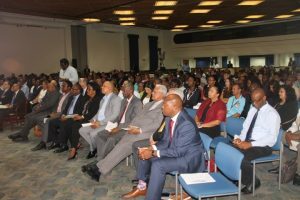 “Production of vegetables or fruit crops in Guyana or Suriname will mean nothing to the majority of the population in the Caribbean if they cannot have access to it through affordable transport,” she told the official opening of Caribbean Week of Agriculture 2018 held at the Lloyd Erskine Sandiford Conference Centre. Her comments came just days after President of the Health Caribbean Coalition, Sir Trevor Hassell urged that large swathes of land in Guyana, Suriname and Belize be taken up and planted to produce foods that would help beat back rising non-communicable diseases such as diabetes and hypertension as well as obesity and overweight. The Barbadian Prime Minister said with commercial banks having large amounts of monies, there was scope for investors to take advantage of agriculture investment opportunities in Guyana and Suriname instead of merely having them as ideas on paper. “I welcome the renewed emphasis for cross-border investment to which the FAO (Food and Agriculture Organisation) spoke and for which I know from colleague heads in Guyana and Suriname will be made available to our region but they cannot remain on a platform or in a letter, they have to be given life and to be given life it means that the integration of production within the context of the Caricom Single Market and Economy is absolutely critical,” she said. Attendees at the opening of the Caribbean Week of Agriculture 2018. Seated third from right is Guyana’s Agriculture Minister, Noel Holder. Barbados’ liquidity, she said, amounts to US$4.5 billion but there were limited investments and opportunities to invest in regional agriculture. A European Union-funded study recommends the establishment of three hubs- Trinidad, Barbados and Miami or Jamaica- to move huge amounts of fresh fruits and vegetables throughout the Caribbean. At the 14th meeting of the Alliance For Sustainable Development of Agriculture and Rural Milieu, top regional officials and other stakeholders also heard that the Trinidad hub could serve Guyana, Suriname and Grenada; the Barbados hub could serve the Eastern Caribbean and the northern Caribbean hub would be in Jamaica or Miami. The study finds that it is cheaper to ship goods to the Caribbean but quite expensive to do so from the Caribbean partly due to the fact that in many instances there are less than one container loads of items that need to be moved, inadequate cold storage, port facilities and logistics. In terms of the hub, participants in the Alliance meeting were told that already there are existing operators such as Trinidad’s Point Lisas Industrial Development Corporation and Tropical Shipping that have been facilitating less than a container load for small producers, other shipping facilities in St. Lucia, the Barbados Ice Company that has cold storage facilities for perishables for intra and extra regional markets, and Bunny Imports and Exports in Trinidad that provides an end-to-end service that includes customs, cold storage and direct delivery of fruits and vegetables. “It comes down to targeted investments and relationships with the private sector to allow these things to happen”, the official said in briefing other alliance stakeholders including Guyana’s Agriculture Minister, Noel Holder. Against the background of lengthy customs procedures, the meeting heard that the Guyana-based CARICOM headquarters has designed a single administrative document for a single-window system. However, the document needs to include provisions for sanitary and phyto-sanitary measures. The session also heard that there are plans to draft harmonised legislation and customs procedures and a database on market access including entry requirements in and out of the Caribbean. The Prime Minister of Barbados said “the time for talk must be over as it relates to agriculture in the region” where the estimated food import bill is US$4 billion. She noted that more than 50 years ago, Barbados had been producing more food with less technology and less investments. Among the questions the Barbadian leader said needs to be addressed is the less than satisfactory approach to integrating production, marketing and research to ensure sustainability of food in the Caribbean.